The Cabrio with the glazed telescopic roof fully closed. The EVM Cabrio open topped Sprinter with the roof opened. Ready for the ultimate test, driving around with the roof open at the top of Kirkstone Pass and the temperature well below zero! Rob Orchard takes a closer look at EVM’s Cabrio – gimmick or practical? 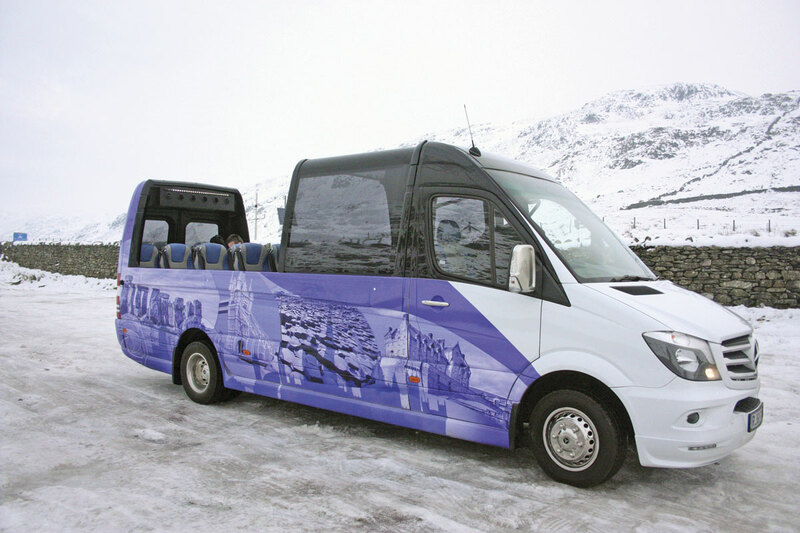 At first glance you would think that a freezing cold day with snow on the ground would hardly be the best day on which to take a closer look at EVM’s Cabrio open top Sprinter. As journalists, we can rarely dictate when we can get our hands on new vehicles, we just have to take the opportunities when they present themselves. As it turned out being a cold day did have some advantages. 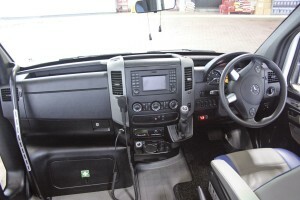 The dash on the vehicle is largely the standard Sprinter unit with multi function steering wheel. So is the EVM Cabrio a serious project or just an attention seeking gimmick? I know the EVM team well, I’ve been reporting on them in these pages for more than 16 years and I know that they do not go into projects without good reasons. Yes they have a reputation for pushing the boundaries and being innovative but there is usually a sound business case behind them. The Cabrio is just such a case and it certainly isn’t just a gimmick, it came from genuine demand. So what is the Cabrio? 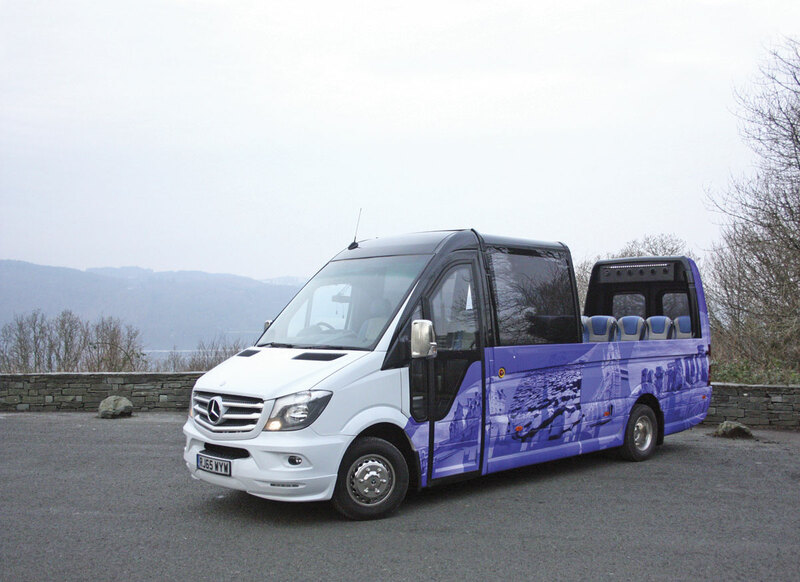 It is a standard Mercedes-Benz Sprinter 516 or 519 van where the top section of the van body is removed and replaced with a fully glazed unit which can be opened up to turn the vehicle into an open topper. The telescopic glazing is a bespoke unit manufactured by CALECHE BV in The Netherlands. They have been building the unit for some years and EVM are the distributors for the product in the UK and Ireland. Interestingly EVM also produce complete vehicles using the roof for CALECHE BV who sell them on the Continent. EVM also sell them through their European dealers. 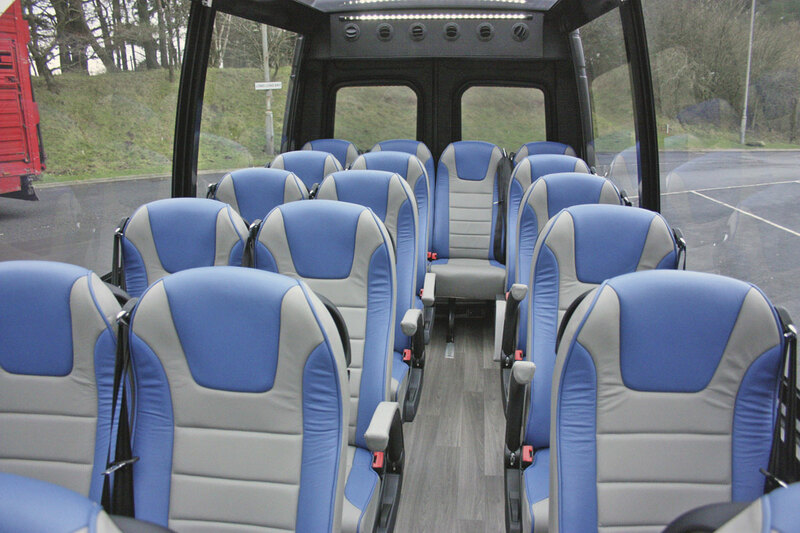 The interior seats 19 passengers plus courier. The unit consists of three sections which telescope into each other. The first section, that nearest the front end, does not move but the the other two sections telescope into the first. The movement of the sections is undertaken by guide rails and an electronic belt system set into the side of the vehicle. One of the first questions everyone asks is how do you achieve structural integrity of the body in the open and closed positions and prevent water ingress at the joints. In the open position structural integrity is achieved by the ring frames in the front section and the extreme rear section which marry up to the originals in the Sprinter body. In addition, along the sides below the window line, additional corrosion protected steel tubing is added to the basic frame of the vehicle to ensure the structural integrity of that area. Tip-up courier seat mounted next to the entrance. The really clever bit is when the roof is closed. Once the roof has been slid back into position, the ring frames are inflated raising them slightly until they lock into the closed position which restores the original ring frame structural integrity and also prevents any possibility of water ingress. The body with the glazed section has been fully tested and meets all EU legislative requirements including R66. There are a couple of limitations on the use of the opening mechanism but they are understandable. Before the roof is opened or closed the vehicle has to be stationary and preferably on a flat surface. These actions cannot be undertaken with the vehicle on the move, safety inhibitors prevent it. Once the roof has been opened the vehicle can be driven with the roof remaining open. Opening or closing the roof is simple. The driver simply presses a button and you can actually hear the system exhausting the gas from the pillars which also unlocks the sections. A buzzer then sounds and continues to sound whilst the roof sections slide back. To close the roof the system is reversed and again you can hear the system gassing up and the reassuring ‘clonk’ as the sections lock together. The whole sequence takes longer to describe than to actually happen. In the tests I did with it, the roof opened in under 30 seconds and closed in under 45 secs. 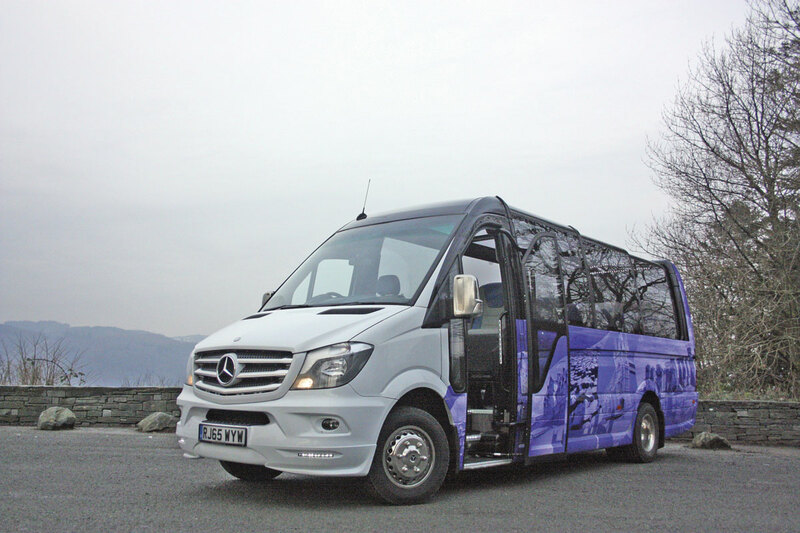 The base vehicle is a standard Mercedes-Benz 516 Sprinter although the 519 can also be specified. It has a wheelbase of 4.325m, overall length of 7.345m, width of 1.990m and a height of 2.8m. The vehicle is fitted with the 163bhp Mercedes-Benz four cylinder, direct injection, common rail, turbocharged engine to Euro6. This is matched to the Mercedes-Benz 7G Tronic Plus seven speed fully automatic transmission. Steering is powered and braking is an anti-lock system with discs all round. In addition safety systems include ESP, ABS, ASR and BA. Electrics are 12v with 100 Amp batteries. There is a 100 litre fuel tank and a separate AdBlue tank. The vehicle has a digital tachograph and is speed limited to 100kph. Standard driver features are Comfort driver’s seat trimmed in matching simulated leather and with armrests and three point belt. There is a multi-functional steering wheel, Bluetooth preparation; cruise control; airbag and central locking. Additionally EVM fit a 12v DC socket and a USB charging port.and reversing camera integrated into the Audio 15 heads up unit. The large windscreen is tinted and laminated with a deeper tinting at the top. Twin electric sunblinds are fitted and the side windows are electrically operated. Pelmet down lighting is provided below the window line. Externally the vehicle has an EVM front bumper with integrated day time running lights, and fog lights. The bumper and grille are in matching body colour and the grille itself is chromed. Mirrors are standard Mercedes-Benz with in-cab control of heating and movement. The mirror backs are chromed as are door handles. The sides incorporate an EVM body skirt system in matching body colour and the rear has the normal full height glazed rear doors giving access to a small luggage area. Luggage space is not seen as a requirement on this type of vehicle. Chrome finish wheel liners complete the package. The front entrance is fitted with a new design of Masats plug door giving access to a three flat, wide steps leading to a flat saloon floor. The floor is an NMI Smart floor with six sets of seat tracks and is trimmed in wood effect Tarabus non-slip flooring. The body sides and, where present, the ceiling are in soft touch ABS finish. Hidden behind the cladding is the usual EVM feature of extensive thermal and acoustic insulation. 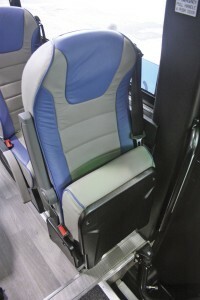 Seating is provided for 19 passengers in luxurious EVM Executive Class 110 reclining seats trimmed in simulated leather and with three point belts, aisle side armrest and magazine net.. The rear unit which distributes heating and ventilation at the upper level. Note also the LED lighting. Lighting, which cannot be incorporated into the roof section as normal, is fitted behind the driver’s bulkhead and focussed rearwards and a similar system is adopted at the rear. 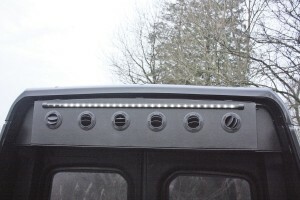 In addition there is down lighting below the window pelmets at waist height. Additionally there is strip lighting to the entrance step edges and additional down lighting at this point and for the driver’s door. All lighting is LED. Heating and ventilation uses the Mercedes-Benz HH9 in-dash Tempmatic air conditioning system at the front, convection radiators down both sides of the saloon fed from an H12 auxiliary hot water heater and an Eberspacher EV814 14kw air conditioning system ducted through the rear bulkhead and focussed forward and down. There is a radio CD unit with integral PA system and speakers mounted in the front and rear bulkheads as well as the dash. 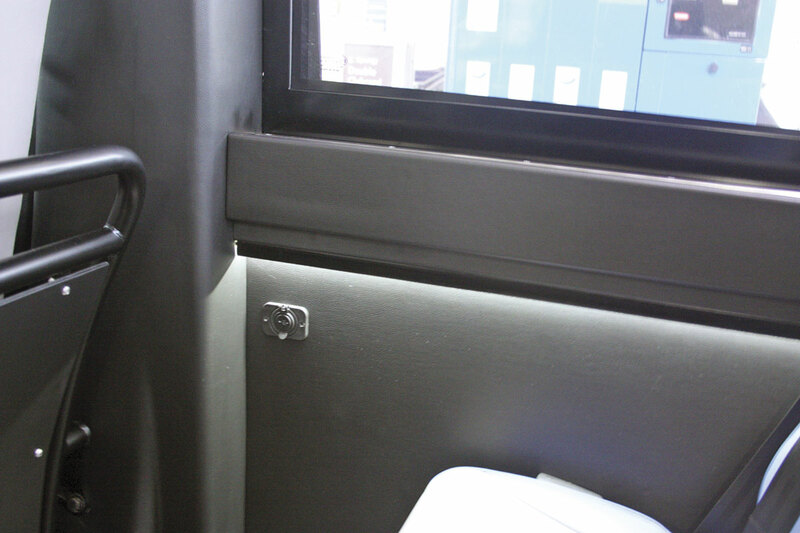 There is a hand held microphone and a socket on the near side B post whilst the driver has a pedestal mounted microphone mounted on the offside B pillar. Additionally there is provision for an i-Pad to be linked into the system. As I said earlier it was a very cold day when I inspected the vehicle with ice and snow on the ground and I was doing this drive in the Lake District! Accompanied by EVM’s Danny Magee, we decided to go for it and put the Cabrio to tackling the long climb from Windermere up to the top of the Kirkstone Pass at an altitude of 1489ft. Two days before our visit it had been closed due to snow! I particularly wanted to see how the automatic transmission would behave itself in these conditions. I needn’t have worried because it completed the climb faultlessly. There was no hint of shuttling which I thought might occur. Similarly later when we dropped back down the hill the transmission gave a good amount of retardation and again without any tendency to shuttle between gears. We went up the hill with the roof closed and I was impressed with how the unconventional air conditioning system maintained a comfortable atmosphere and kept the side windows clear of condensation. The lower level convection heating maintained a good heat balance within the saloon. At the top we decided to open up the roof to find out what it would be like driving in an open top vehicle on a really cold day. It was impressive, despite the obvious possibility of cold air ingress from the open roof, the heating and ventilation system did achieve a perfectly comfortable environment, in fact at times you forgot that the roof was open. The EVM Cabrio isn’t for everybody but if you do sightseeing trips through areas with stunning scenery, or you are involved in city and town sightseeing or perhaps engaged in the wedding market then the EVM Cabrio does offer you a new dimension and the opportunity to earn extra money. You will of course have to take care of the vehicle. It is recommended that the system which operates the opening roof is fully serviced and checked annually which seems eminently sensible. This isn’t a vehicle you would use for any work, it is a special vehicle for special work and if looked after should have a long and productive life. Some operators have already recognised the potential because EVM have orders. I cannot reveal who has ordered them because naturally they are looking for major local publicity coups when they put them into service. So EVM Cabrio: practical or gimmick? Definitely very practical if used properly.